My friends and I are all about flavored moonshines lately. 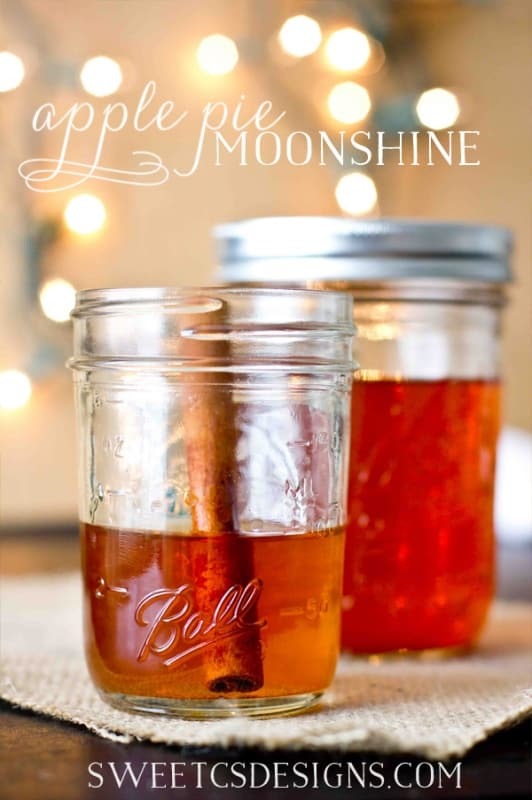 No, these aren’t traditional moonshine- we’re not distilling our own alcohol (that is totes illegal, btw…) but this recipe for Peach Pie Moonshine uses everclear to make a strong, delicious and perfectly sweet drink that is great for sipping on it’s own, with iced tea, with Sprite… it’s so good! We also really like to give these as gifts. Since they taste better after letting the moonshine flavors to develop, you can keep on hand for birthdays, anniversaries, and hostess gifts for our friends who drink. 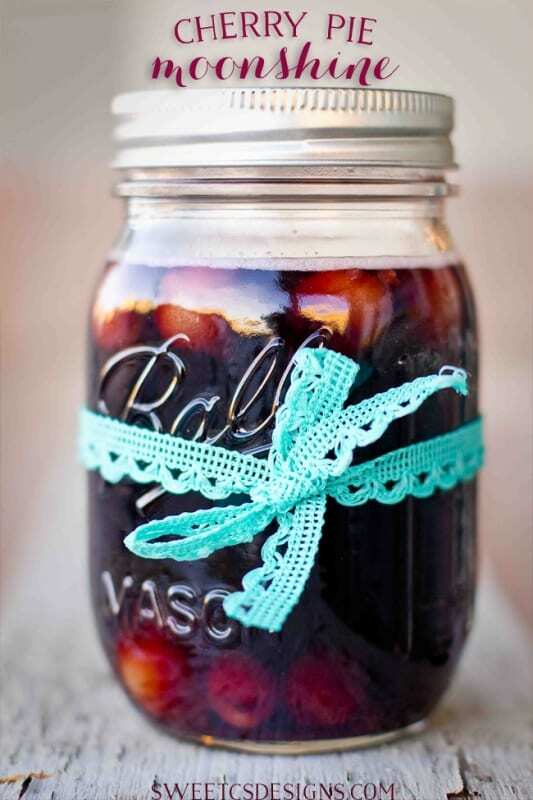 While is is more expensive to make one batch than a bottle of wine, this will make over 12 jars, so individual jars are far less expensive- and so cute as gifts! 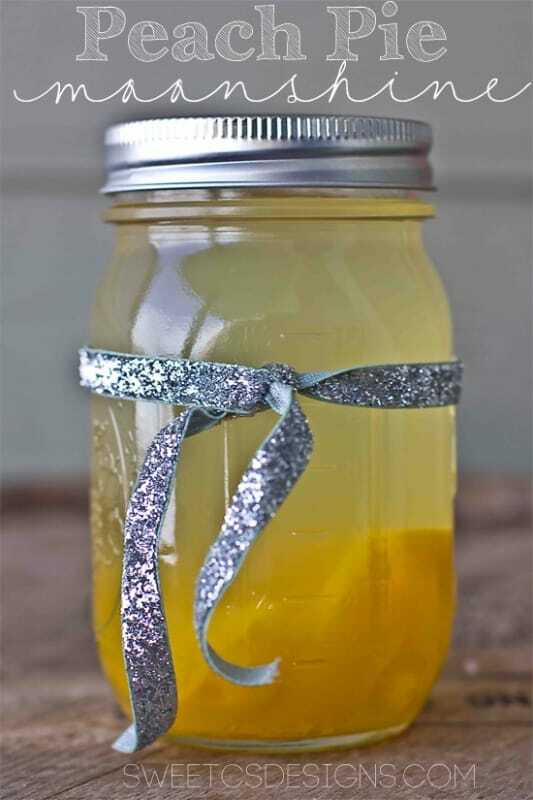 Wrap a pretty ribbon around the moonshine and include a little gift tag suggesting drink ideas, add to a bottle bag, or place in a gift basket. If you haven’t seen my Apple Pie and Cherry Pie Moonshines, be sure to click the images below to check out the recipes! I’ve heard from a few readers that Everclear isn’t available in some states (PA is the one I hear the most.) For a workaround, I’d suggest vodka. It won’t be as strong, so you could take out 1/2 of the bottles of juice, or enjoy it as a bit calmer version. In case you haven’t had everclear before- IT IS STRONG. This is a drink to enjoy in moderation for people 21+. Since it is so sweet, it is easy to over consume. Don’t drive after drinking this moonshine. Add all ingredients but everclear into a large stockpot. Bring to a boil and stir often for 5 minutes. Remove from heat, cover, and let cool completely. Pour into mason jars (I like to keep the peaches in- it gives more flavor and sweetness without additional sugar in the recipe.) Since it can be hard to pour peaches into a jar without spilling liquid everywhere, I usually fill only 3/4 of the jar full and spoon the peaches in after. Store in a cool, dark place for over 2 weeks to continue to develop flavor. DRINK IN MODERATION- THIS IS A VERY POTENT DRINK. Mixing with tonic, soda, lemonade is delicious and helps to not overserve. It shouldn’t since ever clear is so alcoholic. The peaches might freeze inside it, but it is SO alcoholic, I am not sure. Being the peaches are left in the jar. How long will they last? I love the V8 mango peach splash and was considering using 1 64 oz of that along with the Grape juice. Thoughts? Since this makes so much (the cherry moonshine). How long can you store this before it goes bad? You have 6lb cans of peaches. Is this right? Do you seal the jars like all canning recipes? I don’t because of everclear’s extremely high alcoholic content. But you can if you’d like- just leave some room in the jar. i do have one important question once you fill the jars do you heat seal them or just place the lid and ring on and good to store just like that? We just keep them like that. Everclear’s extremely high alcohol content is very helpful in keeping germs at bay- also since you’re boiling the ingredients and hopefully using a sterile new jar, you should be just fine. I live in Pennsylvania and Everclear 151 is readily available. I buy it all the time for my moonshine recipes. Do these taste strong? I’ve had apple pie moonshine before and it hardly tasted like alcohol but snuck up on me because I was drinking so much so easy. Anissa- this is SNEAKY!!! It doesnt taste strongly of alcohol- but it is VERY alcoholic. We’re talking one ounce per serving, and no more. But man- it is yummy!! !